Amsterdam, NL – Video games are quickly becoming a hot topic in cognitive training. Many see them as a potential tool to help patients improve their performance and memory, yet little is known about how different types of video games may affect white matter in the brain and cognition. 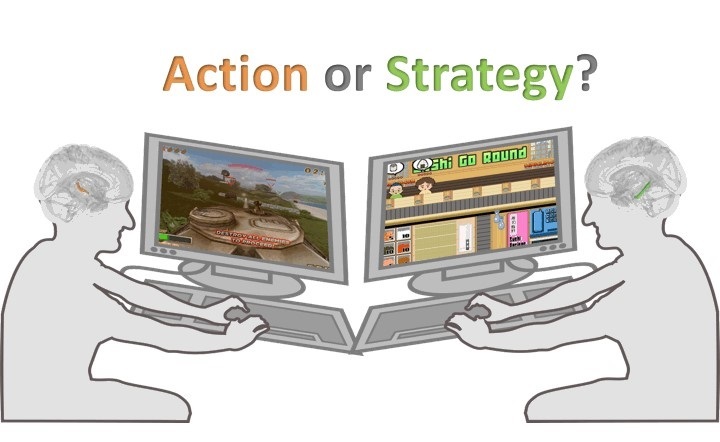 In a new study in Restorative Neurology and Neuroscience, investigators analyzed learning on two different types of video games – action and strategy – to determine if they were functionally different. They found that cognitive performance and white matter connectivity in the brain predicted how best we can learn to play the two types of games. Researchers discovered unique results from each type of game. Specifically, they found that processing speed and white matter connectivity in a brain region related to memory were linked to learning to play the strategy game, while learning to play the action game was related to a brain region governing mood. Both genres of game lead to better performance on tasks having to do with working memory. They also found that improved performance on a speed task was unique to subjects playing the strategy game. Adults of varying ages were recruited for the study, but all had little to no previous game playing experience. Subjects underwent an MRI scan and then were asked to play two different games, one action game (Tank Attack 3D) and one strategy game (Sushi-Go-Round). To measure white matter integrity, researchers used fractional anisotropy (FA), obtained by diffusion tensor imaging (DTI). Working memory and inhibition predicted learning of both games, but better performance on the perceptual speed task was related only to the strategy game. The DTI results revealed key differences between the two genres of game: white matter FA in the right fornix/stria terminalis correlated with the action game learning and white matter FA in the left cingulum/hippocampus was related to the strategy game learning, even after controlling for age in both cases. While researchers found that playing strategy games better engaged memory and cognitive control brain regions, making them better suited for improving memory tasks, they hypothesize that action games that stimulate the limbic area and elicit more emotional arousal might be beneficial for other clinical populations like patients with mood disorders. White matter integrity of different brain regions uniquely predicts action (in orange) vs strategy game (in green) learning (credit: Chandramallika Basak and Nicholas Ray). Full study: “Evaluating the relationship between white matter integrity, cognition, and varieties of video game learning,” by Nicholas R. Ray, Margaret A. O’Connell, Kaoru Nashiro, Evan T. Smith, Shuo Qin, and Chandramallika Basak. Published online in advance of Restorative Neurology and Neuroscience, Volume 35, Issue 5 (October 2017), DOI 10.3233/RNN-160716, by IOS Press. This project was supported in part by funding provided to Dr. Chandramallika Basak by the Darrell K Royal Research Fund for Alzheimer’s Disease. We thank W. Christian Martin, Xi Chen, M. Irene Cunha, Melissa Druskis and Juan Mijares for assistance with data collection. Full text of the article is available to credentialed journalists upon request. Contact Diana Murray, IOS Press at +1 718-640-5678 or d.murray@iospress.com. Journalists wishing to interview the authors should contact Chandramallika Basak at cbasak@utdallas.edu. Celebrating its 30th anniversary in 2017, IOS Press (www.iospress.com) is headquartered in Amsterdam with satellite offices in the USA, Germany, India and China and serves the information needs of scientific and medical communities worldwide. IOS Press now publishes over 100 international journals and about 75 book titles each year on subjects ranging from computer sciences and mathematics to medicine and the natural sciences.